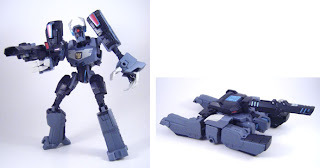 Representing his double nature in the cartoon, Animated Shockwave represents both the Autobot Longarm and Decepticon Shockwave, and features four distinct modes. In "Infiltration Mode," the shorter, stockier Autobot Longarm transforms into a four-legged crane platform. In "Spy Mode," he stretches and manipulates himself into the taller, lankier Decepticon Shockwave, as the crane portion of Longarm's body converts into a hand-held cannon. The symbol on his chest flips between Autobot and Decepticon symbols. 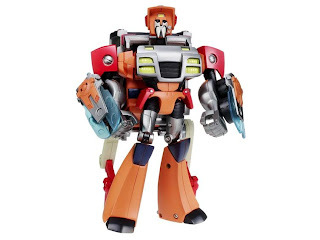 Wreck-Gar transforms into a garbage truck that looks just like "Weird Al" Yankovic he does in the show. He comes with slider-activated articulated lifting arms. He also comes with two translucent blue energy blades that can store in his canister, emerge at the sliding of another lever, and clip onto his forearms in two different configurations. He's very well articulated, including fingers jointed at the first knuckle, and his big feet make him easy to stand. He also has a facial expression that would not seem far out-of-place on Al himself. He doesn't have an Autobot Symbol on his chest, but he does have one on the left side of his cab in vehicle mode.